Whether you will be vacationing in Ormond Beach, Hilton Head or Branson, you and your family will have multiple options and opportunities to enjoy the Fourth of July. From picnics to planes, fireworks and 5Ks, we have compiled a few of our top picks to celebrate the Declaration of Independence. The free Independence Day Celebration in Ormond Beach will feature food, music, games and fireworks. Entertainment will stretch from City Hall Plaza across the Granada Bridge to Rockefeller Gardens. Kids’ activities will be in Rockefeller Gardens from 7:00 p.m. – 8:30 p.m. including a rock climbing wall, a moon walk, an obstacle course, a giant slide, and more. Other entertainment includes a juggler, a magician, balloon twisting, a stilt walker, and of course, special appearances by Abe Lincoln and Ben Franklin. 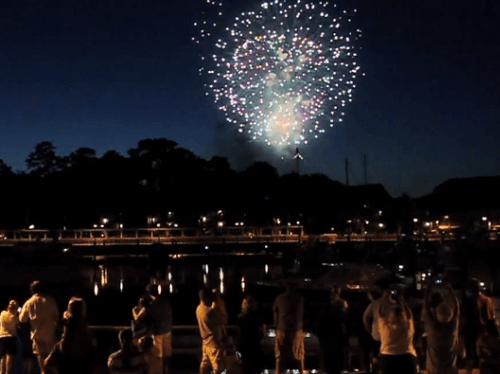 The finale of this celebration will be one of the area’s best fireworks displays! The fireworks begin promptly at 9:30 p.m. on the Halifax River just south of the Granada Bridge. Owners and guests at the Royal Floridian can sit out front and watch the fireworks or take a short walk for a better view. A paved walkway under the east side of the Granada Bridge allows walking from Fortunato Park to Rockefeller Gardens and avoid traffic. Beach Street will be closed north of Granada to Lincoln Avenue and south to Division Avenue. City Hall Plaza will feature Jazz and Blues music, Rockefeller Gardens will feature Rock & Roll and Country. For additional information visit the City of Ormond Beach website. The Alter Eagles are putting on a 4th of July Concert at the historic Daytona Beach Bandshell. No other Eagles Tribute show has a Don Henley look-alike that sings and plays the drums, no other Eagles show has a Glenn Frey clone on guitar and vocals. This is by far the most authentic representation of The Eagles in their prime. Show time is 7:15 p.m. Visit the Bandshell website for details. 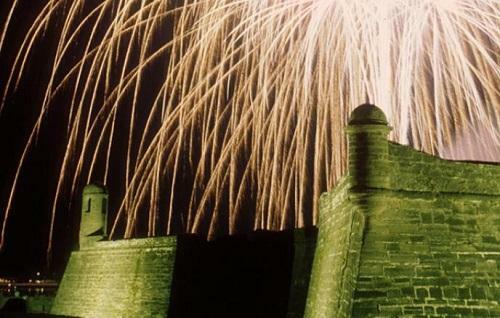 St. Augustine’s Fourth of July celebration at the Castillo de San Marcos includes a live music concert and a spectacular fireworks display over the historic bayfront. “Fireworks Over the Matanzas” is one of the biggest and best fireworks displays on the East Coast, featuring 5,000 individual shells exploding as high as 2,000 feet and as low as 100 feet. Starting at 6 p.m., the popular local band The All Star Orchestra performs a two-hour show of big band and swing music along with patriotic favorites. The concert is free and open to the public, and everyone is encouraged to bring lounge chairs for seating. The fireworks begin at 9:30 p.m. For more information visit the website. Join in as Skull Creek hosts its 32nd Annual 4th of July Celebration. Fireworks begin at 9:30 p.m. from a barge in the Intracoastal Waterway and live music will be at Skull Creek Boathouse, Hudson’s and The Chart House. The 31st Annual Hilton Head Firecracker Run is Monday, July 4th at 8:00 a.m. at Shelter Cove Community Park & Shelter Cove Towne Centre. Over 1,600 runners and walkers of all ages are expected to be on hand for the annual family event which is an Independence Day tradition for many Islanders and visitors. The Firecracker Run is the largest and oldest road race in Beaufort County and one of the top ten races in South Carolina. The fast and flat course runs through Shelter Cove past Broad Creek and finishes at Shelter Cove Community Park. There will be a festive post-race celebration featuring live music, a children’s fun run, vendors, ice cold refreshments, a cool zone, door prizes and more. For additional information visit www.bearfootsports.com. Kick off Independence Day and show off your red, white and blue spirit by decorating a bicycle, wagon, dog or kids for a fun-filled parade around Harbour Town. Meet at the parking lot adjacent to the Harbour Town Lighthouse at 8:30 a.m. to register and pick up decorating supplies. Parade line-up begins promptly at 9:30 a.m. and entries will be judged on patriotism. Holiday fun and activities to follow. For more details visit seapines.com. Every year on July 4th, hundreds of thousands of people gather on the beaches of South Carolina for “Salute From the Shore”. This year, the annual tribute will continue with a flyover of vintage military aircraft and F-16s from the South Carolina Air National Guard’s 169th Fighter Wing at McEntire Joint National Guard Base. Head out with a group of friends to the closest beach with your best red, white, and blue as the flyover will commence at 1 p.m. in Cherry Grove and conclude over the May River Sandbar in Bluffton, SC around 1:30 p.m. For exact timing for your location and more information, visit salutefromtheshore.org. Go out and celebrate your afternoon during Independence Day with the unity of Central Oak Grove Missionary Baptist Church and Grace Community Church with a picnic at Honey Horn from 11 a.m.-3 p.m. Activities include a kids’ zone with its wet and dry slides, bounce houses and dunk tank, as well as live music, food and fellowship. Guests are encouraged to bring their chairs but not their pets. RSVP on Facebook.com/OneHiltonHead. The 29th Annual Fireburst fireworks show will be held over the waters of Table Rock Lake near the Kimberling City Bridge. The Fireburst 2016 Spectacular can be viewed by car, boat or on foot. Over 1,000 boats will crowd the lake for this huge fireworks show, just minutes from the lights of Downtown Branson. If you don’t have a boat to float, head to Indian Point near West Branson, and bring a chair to enjoy the festivities from land. Fireworks show begins at dusk. 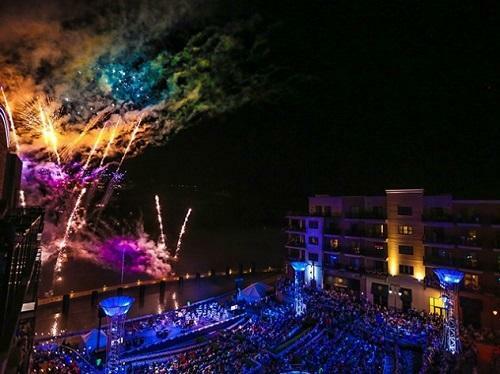 Join Branson Landing’s 9th Annual Liberty Light Up – and celebrate Independence Day – In a BIG Way, a Day Early! The Liberty Light Up Concert will feature Resurrection – A Journey Tribute! Following their performance, the skies over Lake Taneycomo will fill with an amazing choreographed fireworks display. Immediately following the fireworks, stay and enjoy an encore by Resurrection. The Swimmin’ Hole is the place to be for summer time fun filled with games, attractions, contests, crafts, entertainment, mechanical bull rides and more. Come hungry and enjoy a menu of mouthwatering foods prepared by Big Cedar’s Culinary Team. Tickets and all-you-can-play wristbands will be available at the ticket booth. Picnic starts at 3:30 p.m. and fireworks start at dusk. The City of Hollister celebrates its 63rd year of spectacular firework shows with over 800 large displays. Come early and watch the 3rd Annual Little Miss Firecracker Pageant. This 4th of July Show has become an annual tradition, with many families and visitors to the City of Hollister and the Tri-Lakes Area. Presented by the City of Hollister Fire Department and held at Chad A. Fuqua Memorial Park. Fireworks start at dusk. Come join Rockaway Beach for a day full of fun, food, crafts, games, dunk-a-cop, arm wrestling, and more! Be sure to come down early and bring your blanket or lawn chairs and enjoy a great night of fireworks! There will be a beverage garden, music, lawn mower parade, and car show and cruise open to all vehicles. The fireworks begin around dusk. This celebration is funded solely on donations from the community and visitors. Downtown Rockaway Beach just 10 minutes from Branson.